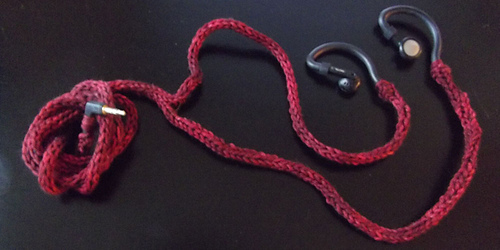 I-cord creates a quick cover for the cord of a simple pair of headphones. As long as your cords, just under ½ inch thick. 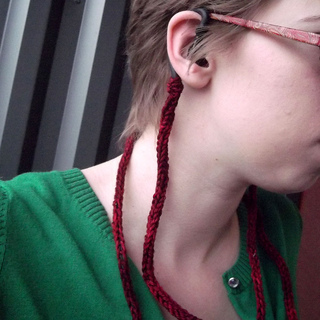 It is best to try this on an old pair of headphones with kinked or twisted cords- knitting i-cord around a pair of nice headphones could damage the cord as you move it back and forth while knitting, and I would hate to see that happen! 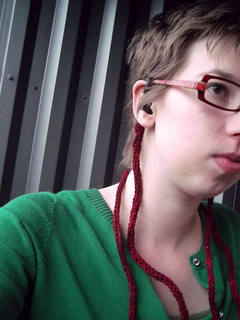 An added bonus- the i-cord seems to help my cord not tangle as much now! This cover is worked in 3 sections- the bottom of the cord from the plug up to where the headphones split, widening for the split, then knitting each cord up to the headphones. Pattern is a FREE 3 page PDF download. Thanks for supporting Midnightsky Fibers!